You are at:Home»iPhone»Display»My iPhone Screen Is Flickering! Here’s The Real Fix. Your iPhone display keeps flickering and you don’t know what to do. The screen flashes, changes colors, or blacks out, but you’re not sure why. In this article, I’ll explain why your iPhone screen is flickering and show you how to fix the problem for good! Sometimes iPhone software crashes, which can cause the screen to flicker. Hard resetting your iPhone will force it to abruptly turn off and back on, which can sometimes fix the problem. iPhone 8 and newer models: Press and release the volume up button, then press and release the volume down button, then press and hold the side button until the Apple logo appears on the screen. iPhone 7 and 7 Plus: Simultaneously press and hold down the power button and the Volume Down button until the Apple logo flashes onto the display. iPhone SE, 6s, and earlier models: Press and hold the power button and the Home button simultaneously until the Apple logo appears on the display. You can release the buttons you’re holding onto as soon as the Apple logo appears. If your iPhone screen continues to flicker after turning back on, move onto the next step! Does The Screen Flicker When You Open A Specific App? If your iPhone screen only flickers when you use a certain app, there’s probably a problem with that app, not your iPhone. First, I recommend closing the app to see if we can fix a minor software problem. You’ll have to open the app switcher to close an app on your iPhone. The iPhone 8 and earlier, double-press the Home button. On the iPhone X and later, swipe up from the bottom to the center of the screen. Now that you’ve opened the app switcher, close your app by swiping it up and off the top of the screen. If your iPhone screen still flickers when you open the app, you may have to delete the app and reinstall it or find an alternative. 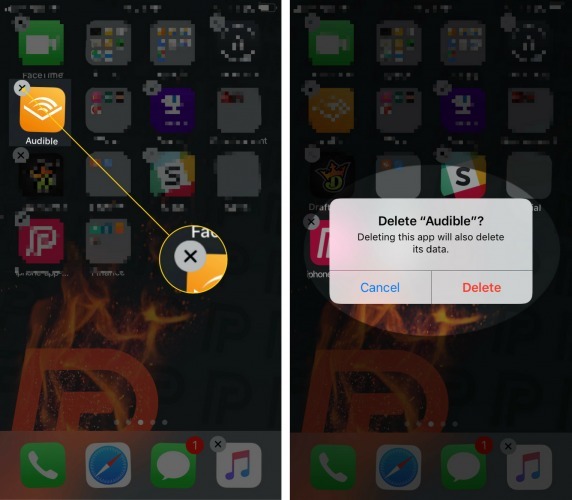 To delete an iPhone app, lightly press and hold on its icon on your iPhone’s Home screen. Then, tap the small X that appears. Confirm your decision by tapping Delete! Many iPhone users have had success fixing their flickering iPhone screen by turning off Auto-Brightness. 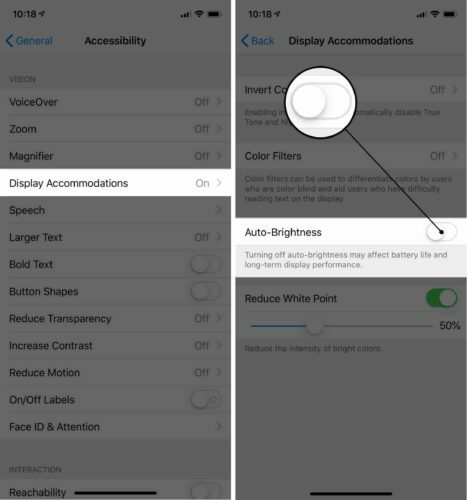 To turn off Auto-Brightness, open Settings and tap General -> Accessibility -> Display Accommodations. Finally, turn off the switch next to Auto-Brightness! We still can’t rule out a software problem even if your iPhone display is still flickering. To try and fix a deeper software problem, put your iPhone in DFU mode and restore it. A DFU restore erases and reloads all of the code that controls your iPhone. Before putting your iPhone in DFU mode, we strongly recommend saving a backup of the information on your iPhone. 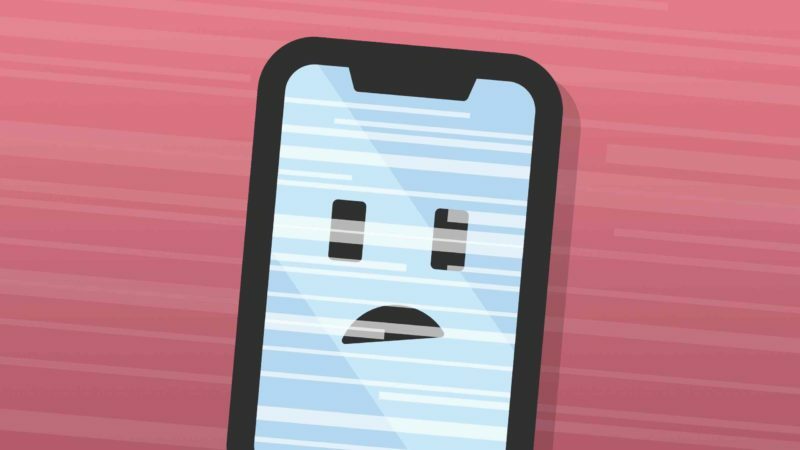 Once you’ve backed up your data, check out our other article to learn how to put your iPhone in DFU mode. You’ll probably have to get your iPhone repaired if the screen still flickers after you put it in DFU mode. It’s possible an internal connector has been dislodged or damaged. When dealing with such small, intricate internal iPhone components, we recommend taking your iPhone to an expert who can fix the problem. If you have an AppleCare+ protection plan, set up an appointment at your local Apple Store’s Genius Bar and see what they can do for you. We also recommend Puls, an on-demand repair company that sends a technician directly to you. The technician can be there in as little as an hour and the repair is covered by a lifetime warranty! Your iPhone screen isn’t flickering anymore! 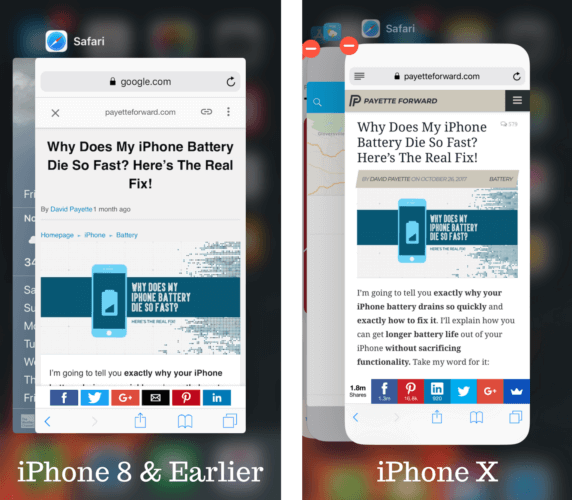 If you know someone with a flickering iPhone screen, make sure to share this article with them. Leave any other questions you have about your iPhone below in the comments section! Previous ArticleiPhone XR: Waterproof Or Water-Resistant? Here’s The Answer! Next Article Why Is My iPhone Screen Blank? Here’s The Fix!